I hope everyone had a wonderful Labor Day weekend! We had so much fun celebrating my birthday with our loved ones (which included my all time favorite cookie cake, lol. I mean what's a birthday without cookie cake!?). I wanted to say a huge THANK YOU to everyone who left me such sweet comments on my birthday and gave me such nice feedback from my last post. I was so happy to be able to share a post that was near to my heart with y'all!!! Ok so who all has noticed how the whole skirt trend from the 90s-2000's has made a huge come back this fall!? I can't help but think I used to have a corduroy skirt JUST like the one I'm wearing above when I was in middle school. AND not to mention, the jean skirt is also having a major moment again. I'm seriously in loooooove with this trend for the fall. The skirt I'm wearing above I scooped up at Dillard's a few weeks ago and it's under $50. One of my favorite ways to style a skirt for fall is with OTK boots and an off-the-shoulder sweater like the one I'm wearing above! Seriously, y'all need this sweater! It is SO soft and cozy, and it's under $50. Not to mention, the top has an elastic band in it so it stays off the shoulder perfectly. You can order it directly from the Studio 6 Instagram page HERE. I can't wait to style it with jeans as well. Another favorite way to wear a skirt is with a bodysuit. This skirt is seriously so versatile and definitely made it to my wardrobe must-have list for fall. Check out the widget below to find other similar items to what I'm wearing above! What are your favorite trends for fall this year!? Follow me over on Instagram, Facebook, or Twitter and let me know. Or leave me a comment below! Thanks so so much for stopping by and reading y'all!!! This blog has always been my outlet and I LOVE writing on here. Now....back to studying for me! Wow!! 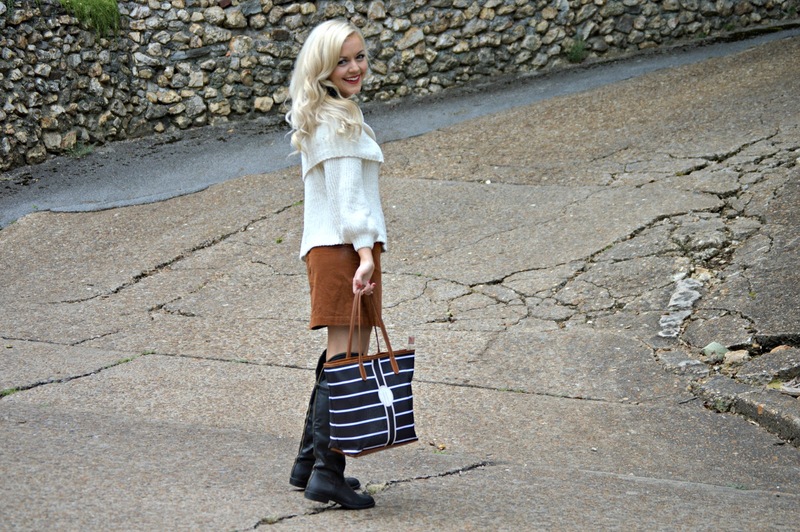 great fall looks! how to styled this skirt and knitted sweater. you are really stylish in this outfits, this outfits perfect matching you thanks you so much for sharing.